The SSIS Script Task is a very powerful component to use in a SSIS package, and most of the time you can achieve with it what you want. Still, I have faced a few situations where a Script Task was not the best solution. In those cases I made a .NET Console application and executed it from within a SSIS package. You want to use the functionality in multiple SSIS packages and do not want to copy (the code inside a) a Script Task over and over again. Your C# application becomes more complex than a single script, and developing it outside the SSIS package allows you to create it with a better structure (tiers, namespaces, classes). You do not want to (or company policy does not allow you to) register an .NET assembly in the Global Assembly Cache of a server on which SQL Server/SSIS is installed. To demonstrate you how this works I have to tell you both sides of the story: first how to develop your .NET console application to accept command line parameters and to return feedback and errors, and then how to call this console application in a SSIS Package and intercept the return code and (error) messages. For developing the console application I used Visual Studio 2017 Community Edition. As this post is not about any specific application, I have made a generic example, in which the console application (which I have called “ExampleConsoleApp”, sorry for that, no inspiration for a more interesting name) accepts three required string parameters and one optional boolean parameter. when using Visual Studio 2015. I’ll walk you through the code for the application, which is underneath. I have added a method CheckArgs which checks if the application is called with command line parameters. If not, a help text is shown for 30 seconds, that describes which command line parameters are required and optional. // TODO Add your own application logic here. Thread.Sleep(10000); // 10 seconds to read the output. // Force an error when param1 has a certain value. // Write the error to the StandardError output. // Optionally write the error also to the StandardOutput output. // Get the errorcode of the exception. // If it would be 0 (the code for success), just return -1. // Otherwise return the real error code. /// Checks if the application is called with command line parameters. /// If not a message is shown on the command line for 30 seconds. /// A more detailed check of the command line arguments is done in private static void ParseArgs. // - if ran interactively, give time to read the message. /// Parses the command line parameters. /// meaningful names instead of numbering them as param1, param2, etcetera. // Set the parameter values to default values first. // these different parts of the value to a single value. // If the next parameter is not found, the value must be of lastArg. // paramCount is used to check that all required parameter values are provided. // Loop through the args array. // Create an if statement for each parameter that is provided on the command line. // Check if there is a value, otherwise keep the default. // In case a parameter value contains spaces, it is spread over multiple elements in the args array. // In this case we use lastArg to concatenate these different parts of the value to a single value. // so spaces in the value should not occur. In Visual Studio select menu option Build > Build Solution or Rebuild Solution. Copy the ExampleConsoleApp.exe and ExampleConsoleApp.exe.config files from the bin subfolder to a folder of your choice. I used C:\Temp. 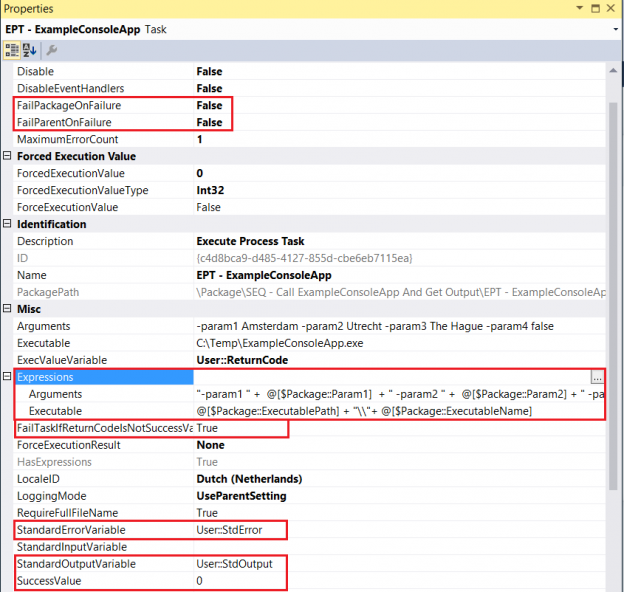 In the SSIS Package we use an Execute Process Task to execute our example console application. There are a few different ways to handle the execution result (return code) of the console application, which I will show you in a minute. Add a number of parameters to the package: ExecutableName, ExecutablePath, Param1, Param2, Param3 and Param4, as shown in the picture below. Optionally this can also be variables, when the values do not need to be configurable after the SSIS package is deployed. Add a number of variables to the package: ReturnCode, StdError and StdOutput, as shown in the picture below. These variables are needed to store the information- and error messages and execution result of the console application. Now you can use an Execute SQL Task or a Script Task to do something with the ReturnCode, StdError or StdOutput values. This is optional. If you do not intend to use the values of StdError or StdOutput, for instance for logging, no extra task is needed. // work when it is executed after successful execution of the console app. // Add code to do something with the values of errorOutput and optionally standardOutput, e.g. logging. Add an Execute SQL Task. On the General pane, make sure SQLSourceType is set to Direct input. Add a connection, for the demo it does not really matter to which database. DECLARE @OutputCode INT = ? DECLARE @StdError NVARCHAR(MAX) = ? DECLARE @StdOutput NVARCHAR(MAX) = ? DECLARE @ExecutionGuid uniqueidentifier = ? DECLARE @SourceGuid uniqueidentifier = ? Finally the demo package should look as follows when a Script Task is used ..
We still have time for a little demo .. I will just run the package with the Execute SQL Task, because it contains the code for logging, so we can check the error message later. As you might have noticed in the code snippets, if Param1 is given the value testerror, a divide by zero error will occur, as it is deliberately programmed in the console app. So let’s run the package with this parameter value and see the error occur! The expected error occurs ..
… and yes, it is the error that occurred in the console application and which was added to the error output stream of the console application. Why it can sometimes be useful to execute a console application instead of using a Script Task in a SSIS package. How you can create your own C# console application that can be executed with command line parameters. How this console application can be executed from within a SSIS Package. How the Return Code, Standard Error and Standard Output streams can be captured in SSIS Variables. How these variables can be used in a Script Task or an Execute SQL Task. Hans is an Independent Business Intelligence and Data warehouse Consultant, working in the Netherlands. He works in the software industry since 1996, with SQL Server since the year 2001, and since 2008 he has a primary focus on data warehouse and business intelligence projects using Microsoft technology, preferably a Data Vault and Kimball architecture. He has a special interest in Data warehouse Automation and Metadata driven solutions. His web site and blog is at www.hansmichiels.com, where you can find other contact and social media details.